Are you contemplating on whether or not to visit Mykonos with kids? 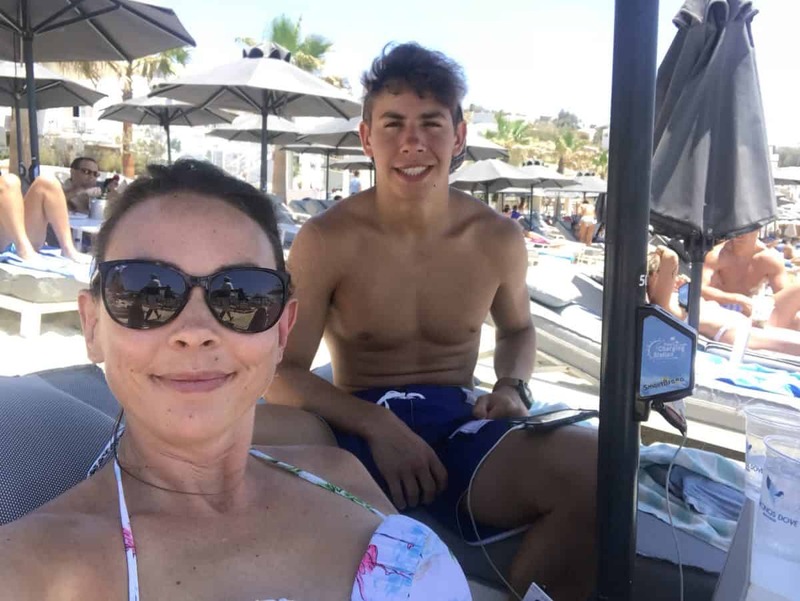 Find out why I think taking kids to Mykonos is completely fine and fun. I know what you are thinking, do not take kids to Mykonos. Well, I disagree. I think taking kids to Mykonos is perfectly fine. Now I am not going to take them to go party at the Toy Room or down to Paradise Beach, but there is still plenty for us to see and do. One or two nights in Mykonos is all you need! I recommend spending one night in Mykonos, maybe two nights. 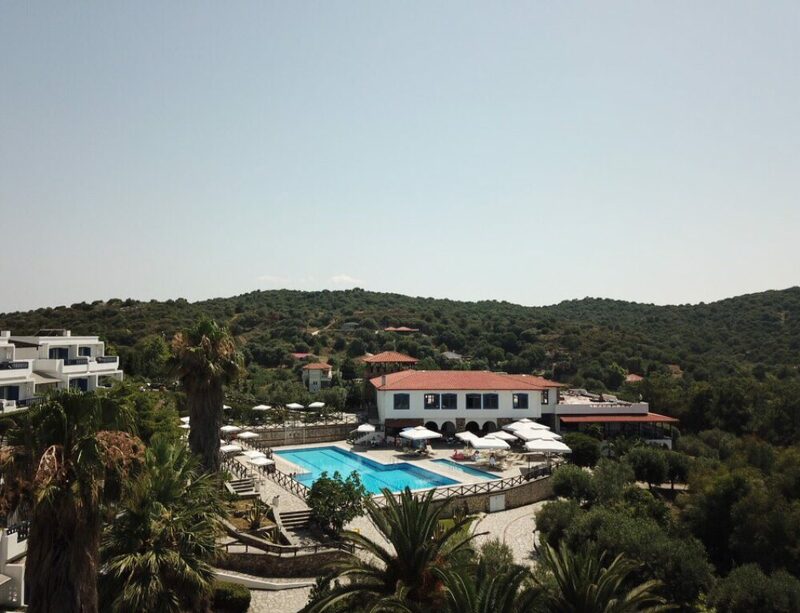 We stayed two night and if my kids hadn’t been completely beached out from our previous visit to Halkidiki then we would have just hit another beach and two nights would have been perfect. As it was, two nights was one too many for us. 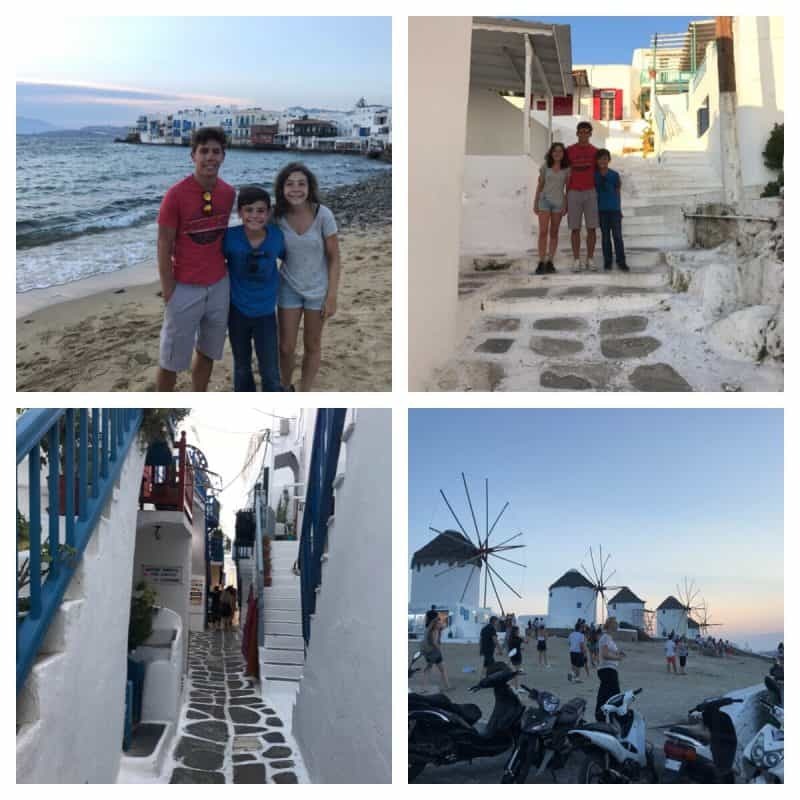 We arrived around 4 PM by ferry from Santorini allowing us plenty of time to get checked into our hotel, rent a car, and walk around Mykonos City. Mykonos is a tiny island, so you can do a lot in a short amount of time. There are lots of great places to eat in Mykonos. I based where we ate on my budget. You could easily spend several hundred dollars on just one meal feeding a family at some of the restaurants on the island. I recommend always checking out the prices before sitting down at the table. 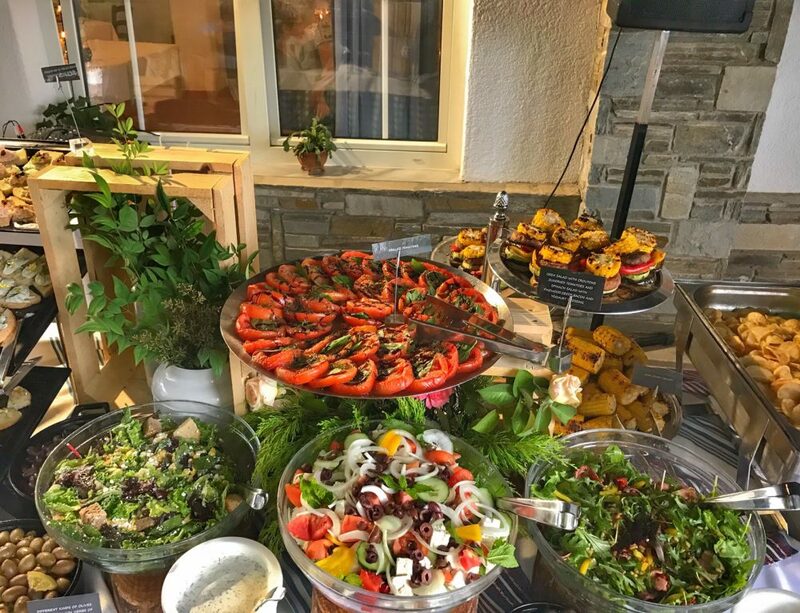 D’Angelos – D’ Angelos is a fantastic Italian food restaurant in Mykonos City. It was the best meal we had in Mykonos. Souvlaki Story -Souvlaki Story is a good option when trying to eat cheap. I highly recommend their gyros. Noah ordered the hamburger and does not recommend it. You can see why in the photo. Sakis – Sakis is another cheap place to eat in Mykonos with excellent gyros. Trio Bambini – Trio Bambini is a gelato shop and creperie. Here’s a photo of the Coconut Dream Crepe, which was absolutely delicious. Further down you can see a picture of their American waffle. There are lots of things to do in Mykonos besides party. Mykonos City is a must see. You cannot visit here and not spend a fairly good amount of time getting lost in their winding pathways. If the nighttime is too crazy for you, come back during the day, when all those people that were out all night are still sleeping their night off. As you walk around it may seem like an expensive place to eat, but I can assure there are some super affordable ones sprinkled in. Our first night there we ate at Soulvaki Story. They have two locations in Mykonos City and they have cheap gyros. Another cheap place to eat is Sakis. Our favorite place to eat is the Trio Bambini a creperie and gelato shop. Just look at our crepe above and this over the top waffle creation named the American! Little Venice is a fantastic little area inside of Mykonos City and is a must see when you are visiting Mykonos. Plan to take pictures and do some strolling. Whatever you do, Do Not wear high heels! For whatever reason the windmills in Mykonos are famous. So, you must visit them and take a photo. You must plan for time at the beach. Mykonos has wonderful beaches. Unlike Santorini, where the beaches are made up of rocks, Mykonos has lovely sandy beaches. 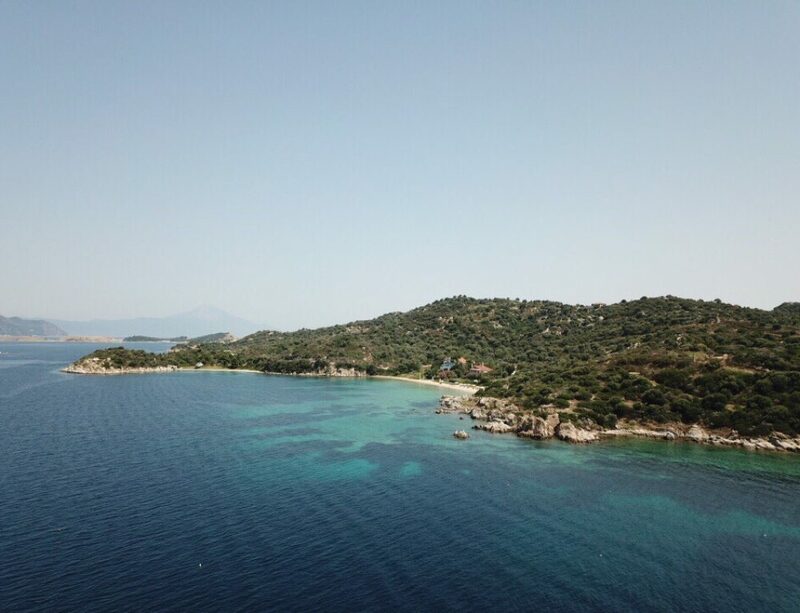 Plati Gialos – Our favorite beach is Plati Gialos. You can rent beach chairs at Mykonos Dove Beach for 10 euros a chair, so two loungers and an umbrella for 20 euros. My favorite thing out renting at this place is the umbrellas. They have solar panels on them and two USB ports so you can stay charged. If you are traveling with teens this is a big deal. Anytime you rent beach chairs there is usually drink and food service too. I found the drinks to be too expensive, but the solution was easy. Plati Gialos beach has a little store in between all of the beach bars. Here you can buy alcoholic drinks and ice cream bars for less than 3 euros. The water is cold, but on a hot day it will not matter. They have a fun floating dock that kids like to climb on and jump off, but be careful. It is bolted together and Jonah cut his foot pretty bad on one of them. I ended up having to carry him off the dock and back to where we were seated. He said my “mom power” must have kicked in and I guess it did, because I was surprised how easily I managed him even though he is not so little anymore. 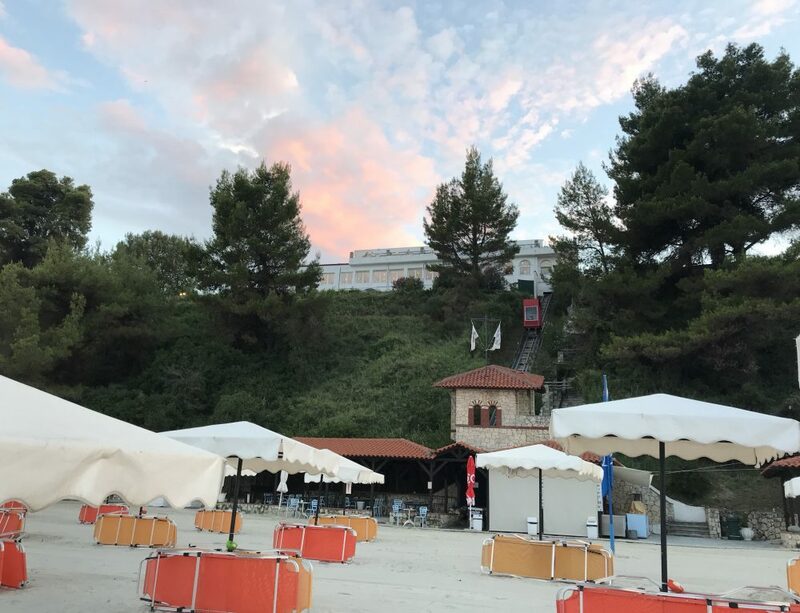 Ornos – Ornos seems to always be the recommended beach for families by the locals, but for us there were just too many people. It was jam packed with people and the vibe didn’t feel as family friendly as Plati Gialos did. Agia Anna is another low key beach we liked. It’s tiny and not near as popular, which with kids is a good thing. You can rent two chairs and an umbrella for 18 euros. There’s a free parking lot here. This is also where you will find Pinky beach. They have a swing down in the beach, which is a perfect photo opportunity. Paradise Beach – I only go here when I do not have the kids with me, but it is a nice beach and I have seen kids there. They beach restaurants are basically clubs so don’t be surprised when people start dancing and drinking. And by dancing I mean bumping and grinding. There is a super fun go kart place in the middle of the island. For 15 euros a person you can zip around for 10-15 minutes on their course. Their go karts go fast! I was worried that it was too hot of a day for go karting, but their track is on a hill and there’s a nice breeze up there. 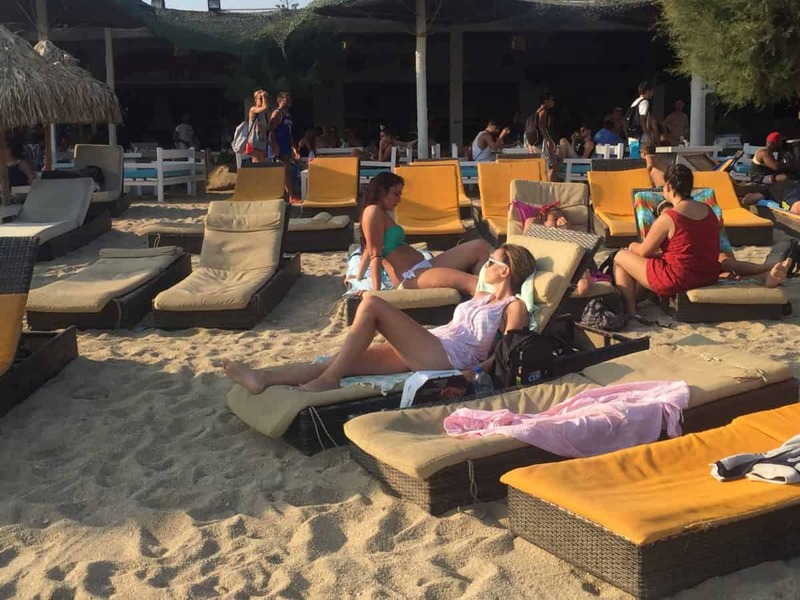 On the off chance you can ditch the kids and go out Mykonos is jam packed with bars and clubs. Apparently Lindsey Lohan has a club somewhere on the island that’s really good. I have not experienced it first hand, I have experienced two good clubs. Toy Room – They have excellent security. My sister had a guy bothering her and they made him leave, much to our relief. Hakkasan – Yes, like the Hakkasan in Vegas. There are of course a number of day trips you take while you are here, but to me the point of coming to Mykonos is to experience the beaches and Mykonos city, so why leave. If you have a day to kill and your kids do not want to visit another beach, take them on a day trip tour of Delos. There are several places that will be obvious that you do not want to stay at with children. What can be super fun as a single adult can quickly become a nightmare for kids and parents that didn’t sleep good all night. Originally when I began planning our trip I wanted to stay in the city. I wanted to be right there where all the action was, but the more I thought about this, the less this seemed like a good idea. My kids are well traveled and have seen a lot of things good and bad. But I really do not think they need to be exposed to young singles totally and completely raging out. Which lets face it, that’s why most people visit Mykonos. It’s definitely one of the biggest party destinations in the world. And it is fun, my sister and I got to experience this side of it once. In fact, if you have followed along with me for a long time you may recall that on my last visit to Mykonos I ended up staying in a complete dump. (Here’s a review I wrote titled: Junkyard Living. )Lucky for me, the kids happen to not be with me. It was just my sister and I, and the two of us just sucked it up and powered through it. This time I was way more careful. I decided to avoid all booking sites to find a hotel, since it was the deceitful listing on booking.com that landed my sister in a gross hotel last time. 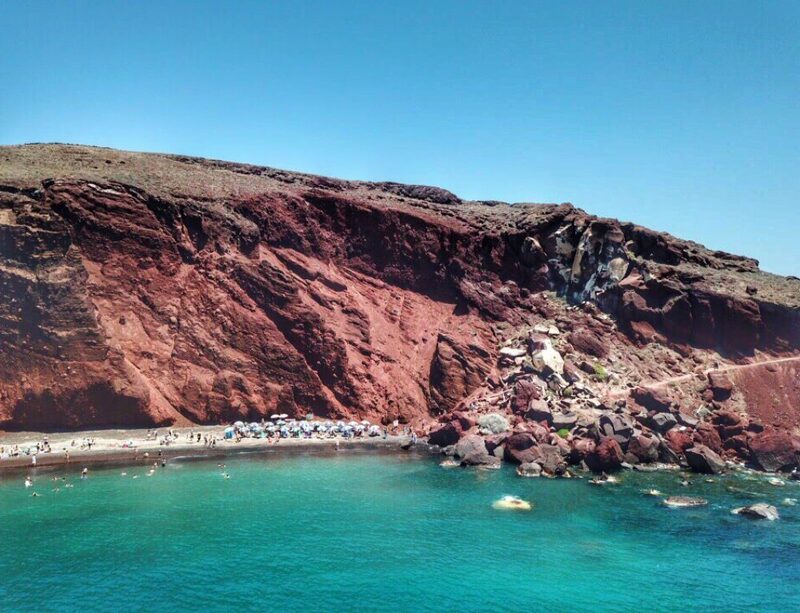 This time I contacted a blogger in Santorini, Olga from https://santorinitraveltots.com/travel. We randomly connected online and I ask her if she could help me find somewhere to stay. Sure enough, she ask around and got us in contact with Terra Maltese Mykonos. This is the perfect place to stay if you are needing to spend less than $200 per night and stay somewhere nice. We stayed in one of their triple rooms and they brought in an extra bed for us. The room also included a decent breakfast buffet every morning for 180.00 euros a night. It was a thousand times better than the last place I stayed. Oh, and it had a pool too. Another plus of staying here, was they were the middle man for my car rental. In Greece it is always better to let the locals help you with these things. Eat Cheap: It is always cheaper to order a gyro than it is to get a gyro plate. I swear it’s the same amount of food at half the cost. Order Smart: Younger kids can have a hard time holding a gyro together and eating it. It may be better to order them a “small size” of the restaurants gyro or soulvaki plate. Lots of Ice Cream: If you are visiting in the summer plan to get your kids ice cream at least once a day. Everyone stays happier this way. Always carry water with you. Do not drink their water, instead pop into a grocery store and by each member of the family a few bottles of water. Sunscreen, sunglasses and hats: Never leave the hotel room without both and wear all the time. Rent a car: Getting around Mykonos can become difficult quickly if you are relying on taxis. Last I heard, they have less than 50 taxis on the island. It only costs 60 euros a day to rent a car in Mykonos. Mykonos has a ferry port and an airport. Easy Jet flies into this airport and they are always offering cheap fares. We used Sea Jet to ferry from Santorini to Mykonos and then flew out on Easy Jet to Paris for 37 euros a person. Don’t forget travel insurance! I’m a fan of Travelex insurance, because of the variety of options. Protect yourself from possible injury & theft abroad. I have gotten extremely sick twice now out of the country, one of the times was in Greece. Plus, Noah has had seizures in other countries, so I always recommend getting some sort of coverage. Read more about why you should always carry travel insurance here.